The Expedition 20 and 21 crewmembers gathered on the International Space Station Oct. 2 after NASA astronaut Jeff Williams, Russian cosmonaut Maxim Suraev, and Canadian space tourist Guy Laliberte arrived onboard. This story was updated at 10:13 a.m. EDT. Two new crewmembers and a space tourist arrived at theInternational Space Station Friday. NASA astronaut Jeffrey Williams, Russian cosmonaut MaximSuraev, and Canadian space tourist GuyLaliberte docked at the orbital outpost at 4:35 a.m. EDT (0835 GMT). Williams and Suraev are beginning a six-month tour of duty onthestation as Expedition 21 and Expedition 22 crewmembers. Laliberte, abillionaire acrobat who founded the world-famous Cirque du Soleil circustroupe, paid about $35 million to the Russian Federal Space Agency for his 12-dayspace jaunt. The trio liftedoff on the Russian-built Soyuz TMA-16 spacecraft Wednesday from theBaikonur Cosmodrome in Kazakhstan. Upon arrival at the International Space Station (ISS), crewsaboard both the Soyuz and the station began working to seal the link betweentheir vehicles, and opened the hatches at 6:57 a.m. EDT (1057 GMT). 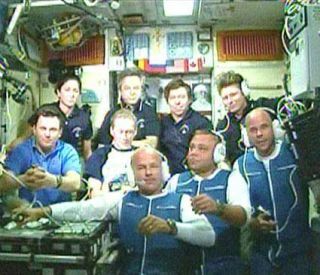 The newarrivals join current station commander Gennady Padalka, a cosmonaut, alongwith Belgian astronaut Frank De Winne, Canadian Space Agency astronaut RobertThirsk, Russian cosmonaut Roman Romanenko, and NASA astronauts Nicole Stott andMichael Barratt. "Everything was wonderful, we made it here allright," Suraev, the Soyuz commander radioed down upon entering thestation. "The crew has pretty much adapted already. I can't even reportany issues at all." The three new arrivals greeted the station crew with hugsand smiles, and then got to say hello to family and officials gathered on theground at Russia?s Mission Control Center near Moscow. "We had a great trip up here and we're happy to beonboard in good company," Williams said. Laliberte said he felt "pretty good" for his firsttime in space, and Suraev gave him a glowing review, saying, "He didgreat. His tolerance for weightlessness was absolutely perfect. Five on a scalefrom one to five." "This is the first time in history when we have threeSoyuzes docked to the station at one time," Padalka said. Laliberte is devoting his space journey to campaigning forwater conservation issues. He founded the non-profit ONE DROP foundation toadvocate for the cause, and plans a massive spaceperformance for Oct. 9 to spread the word about the importance of globalaccess to clean water. "When I founded ONE DROP, it was (or rather, it stillis) desperately urgent to do something to protect water," Laliberte wrotebefore launch on his blog at OneDrop.org. "ONE DROP is already acting inpractical terms, but in the project of going into space, I saw an innovativeopportunity, reflecting the image of Cirque du Soleil and my own image,too." The performance will feature Laliberte reading a poem fromspace, while artists and personalities in 14 cities around the world will contributethrough a simultaneous webcast. People including Al Gore, Shakira, U2 and PeterGabriel will participate in the event, the first artistic performance fromspace. In addition to activism, Laliberte plans to have some funclowning around in space as well - he has threatened to tickle his crewmatesand play practical jokes while on the space station. He is the seventh paying tourist to fly to space on tripsbooked by the U.S. firm Space Adventures. "I'm very excited about this journey I'm undertakingand everyone I'm meeting through it," he wrote. "This is both apersonal challenge, as everything I'm experiencing here is new to me, and agrand project that will benefit my ONE DROP Foundation as well as Cirque duSoleil." The new space station Expedition21 mission is set to begin Oct. 9 during a change-of-command ceremony thatwill install DeWinne as the new station commander. The mission is only thesecond station increment with a six-person crew, doubled from the previous crewcomplement of three. The more crowded station is also an increasingly-large one:The orbiting laboratory is almost completely assembled and is about twice thesize it was when Williams last visited in 2006 as an Expedition 13 flightengineer. But simply building the station does not end its mission, he said. "When we complete it, we need to utilize it,"Williams said in a preflight interview. "My hope is that we get the fullutilization out of this magnificent technical accomplishment." Williams is set to serve as a flight engineer on Expedition21. Then in December he will take over as commander of the new Expedition 22.His crewmate Suraev is a rookie spaceflyer and will take up the post of flightengineer for both Expedition 21 and Expedition 22. The new crewmembers are in for a busy mission full ofscientific research and station maintenance. During their stay they will host twovisiting space shuttle missions, one more Soyuz flight, and a handful ofunmanned cargo craft arrivals. Among the new supplies and equipment to bedelivered on these flights is a new node module named Tranquility, which willinclude a panoramic window called the Cupola. The expedition will also include a spacewalk, orextravehicular activity (EVA) in NASA parlance, in which Suraev will take part. "I do have just one EVA during my mission," hesaid in a preflight interview. "On the personal side, I'm really lookingforward to the EVA. And as a professional, I really want to not make mistakesduring my flight."